The Legend of the Magi Scrolls is a wonderful book about giving – and isn’t that what Christmas is all about? From the original Christmas story through to today, the lessons have been about giving and generosity. The book starts with an original story from the author based on the tradition of a reunion of the Three Wise Men many years after the birth they had travelled to see. It tells of their gifts and what they meant, and tells us what we can give when we have nothing to give. Beautifully told and full of meaning. The book also contains the timeless Story of the Other Wise Man plus other thoughts and stories about Christmas and giving, including a delightful story to be read to children. It ends with a very personal look at Christmas from the author’s point of view and how Christmas affects many of those who have nothing to celebrate. And that ends with a beautiful prayer on behalf of those without a voice. This is a delightful and surprising Christmas book and a wonderful gift for friends and family. Christmas will not be the same again. The first thing I have to say is that this book is written from the heart. Brian Morgan has an international reputation for his work, especially his Christmas stories – and this will add to the accolades. Most of the book is from Brian Morgan’s own magical pen, but it draws from others as well to create what the cover promises – timeless Christmas classics. There are two stories about the Magi, the wise men of old: One by Brian Morgan, which is a beautifully written tale about giving, based on the legend of a reunion of the Magi in AD54. and the second a reprint of an old world-wide favorite, The Story of the Other Wise Man, by Henry van Dyke. Both of these guys are master story-tellers. There are three other offerings by Brian Morgan. My personal pick is a piece drawn on the author’s life as a journalist and his personal look at Christmas from the viewpoint of a surprising range of people. It’s called A Letter to God at Christmas and it ends with a prayer written on behalf of those without a voice. There is also a story called What I Saw: A Shepherd’s Story, which is another original. Finally, there is a look around the world at people who have the heart of a Magi at Christmas. To cap it all off, there is a story to be read to children about giving and sharing, called Wise Owl and the Very First Christmas. I love Christmas books, and this has to be the one I’ve enjoyed most. If you want more from Christmas than hustle and bustle and noisy commercialism, you must read this book and then offer it as a gift to loved ones. This is very special and it’s written by a very special writer. 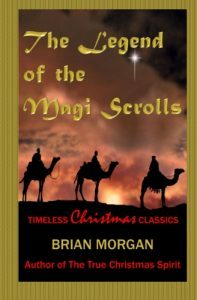 The Legend of the Magi Scrolls is a book about giving and you won’t find anything like it anywhere. I don’t want to spoil it for you, but everything in this book is truly a “timeless Christmas classic”. It has two wonderful stories about the Magi, both full of meaning and message. There is a delightful story for children and another called What I Saw: A Shepherd’s Story, which relates what the shepherds saw on that long-ago night of the first Christmas. However, the one that struck me most was a very personal story by Brian Morgan, called A Letter to God at Christmas, which ends with a prayer written on behalf of “those without a voice”. Such a lovely book. I cried. I hugged the book and didn’t want to put it down. You must read it. Brian Morgan has another Christmas book as well, and I’ll be giving both as gifts this Christmas. I don’t write reviews for books, but this one deserves to be told. I just loved it. I think Brian Morgan has a beautiful way with words and his heart shows in the beautiful things he wrote in The Legend of the Magi Scrolls. I’ve read it three times now and I’ll be giving it to people at Christmas. This book will lift you and touch you and make you think about Christmas in a different way. Just gorgeous. Like to return from The Legend of the Magi Scrolls to the Published Books page?